On Wednesday of next week, Derry City will learn their opponents for the 2018/19 Europa League. Whilst the majority of the media attention will be on events in Russia in the early stages of the World Cup, fans of clubs around Europe will be keenly awaiting their opponents in the early rounds of the Europa League and Champions League. The draw for the Europa League will take place at noon on Wednesday 20th June, and City will enter at the first round stage. 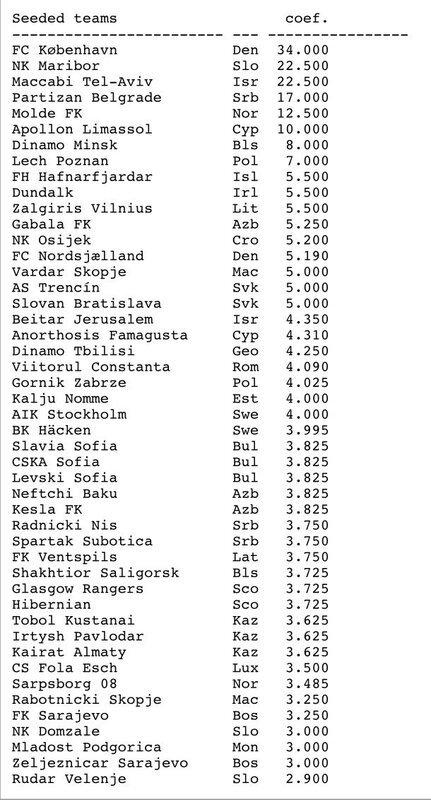 The Candystripes will be unseeded, as will Shamrock Rovers, whereas Dundalk will be a seeded team at this stage of the draw. Casting a glance at the teams that City could face, there are some illustrious names who City could come up against. There are a number of clubs that City have already played before in European competition, including NK Maribor and Shakhtior Soligorsk. Whilst the eye may immediately be drawn to some of the well known names in the draw, it is likely that City will be drawn in a regionalised pot. In the qualifying rounds the teams are divided into groups with the same number of seeded and unseeded teams. A few hours before the draw a computer system is used to prepare the groups such that teams of the same association are not in the same group and and that all groups are about equal strength (in terms of ranking). Estonia, Finland, Iceland, Ireland, Latvia, Lithuania, Luxembourg, Norway, Scotland or Sweden. Following the draw, the clubs will meet to organise the fixtures, with the ties to take place on the 12th and 19th of July. Supporters are encouraged not to book travel until the fixture order is agreed. If that has whet your appetite for the European tests ahead, why not purchase a ticket to the club Europa League Draw. The draw takes place this Friday and the prize is an all expenses paid trip with the team to their Europa League first round tie. The prize includes travel, hotels, transfers and match tickets. Online sales will close on Friday at 12 noon.